For 149 years at the service of local communities. Founded in 1886, Banca Popolare di Vicenza is the first co-operative bank of Veneto and the first bank to be established in Vicenza. The Banca Popolare di Vicenza Group operates nationwide with significant market shares in Northeastern, Central and Southern Italy. The Parent Company Banca Popolare di Vicenza operates directly in the northern and central regions of Italy, while the subsidiary Banca Nuova has a strong presence in Sicily and Calabria. With a view to offering its customers a full and innovative range of services, the Group has set up product companies or entered into business agreements with companies operating in the consumer credit, insurance, asset management and private equity sectors. We are the 7th largest Italian bank in terms of number of branches, the 8th in total assets and the 10th in number of employees. 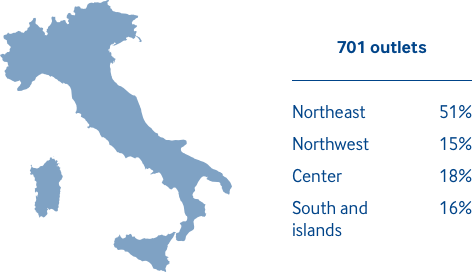 We operate in 16 regions accounting for approximately 96% of Italian GDP. A set of initiatives to revise and improve the BPVi Group's distribution model was launched in 2013, confirming the crucial role of branches as main development channels in the relationship with customers. 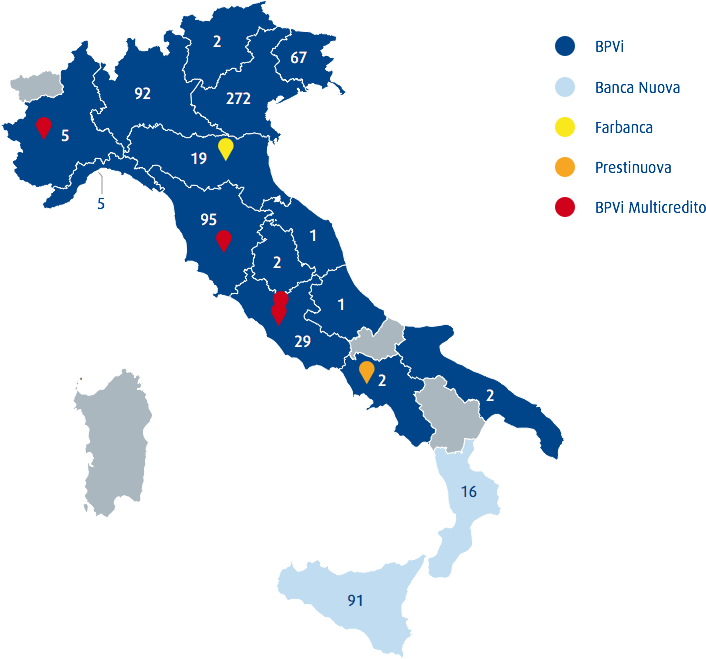 For this reason, in the last few years the BPVi Group has strengthened its presence throughout Italy, in 2014 through the targeted opening of branches in important locations like Naples and Lecce, the acquisition of 1 branch in Turin from Banca Popolare di Spoleto and of 16 branches from Cassa di Risparmio di Ferrara (14 in Lazio, 2 in Emilia Romagna). Alongside and in support of branches, the Group continues to develop alternative and complementary channels to promote Bank-Customer relationships, for example digital channels, contact centres and third-party agent and financial promoter networks. January 2015 saw the launch of BPViGO!, the BPVi Group's new online banking platform: with features scheduled to be rolled out in the next few months, customers will be able to use internet and mobile banking channels as well as new, innovative services like the fully paperless opening of accounts and the possibility to interact with their relationship manager remotely (through the video call feature). The programme for the evolution of the BPVi Group’s distribution model is based on a strengthening of the networks of freelance professionals (Financial Promoters and Financial Agents) in support of the branches’ operations, with the goal of acquiring and gaining the loyalty of a significant number of new customers, both in the Private and in the Small Business segment, assuring high levels of service and adequate risk management. At 31 December 2014, the financial promoter network comprised 119 professionals (56 of BPVi and 63 of Banca Nuova), whilst at the same date, the number of agents operating at the new BPVi Group company called “BPVI Multicredito Agenzia in Attività Finanziaria Spa” counted at 180 professionals (168 at 31 December 2013) operating in 43 provinces. The BPVi Group has 6 Representative Offices abroad, whose purpose is to facilitate commercial transactions between Italian companies and the principal international markets, providing appropriate services for entrepreneurs intending to expand in those areas, and to develop lasting business relations with the principal and most experienced banking counterparties in these countries. In countries where the Representative Offices operate and in the others where BPVi Group does not maintain a direct or indirect presence, to provide the best support to companies in international markets, cooperation agreements have been signed with 71 foreign banks with a total network of approximately 85,000 branches, located in 47 countries. At 31 December 2014, the BPVi Group had a workforce of 5,515 employees. Our people are our key assets: we recognise that their potential and skills play a strategic role in our pursuit of excellence and for the maintenance of a high standard of service based on the Customer First principle. We believe that we can grow with our people, developing their experience and skills and recognising their contribution. This is why we invest in individual talent, offering targeted training paths that everyone can access according to their education and professional development needs. 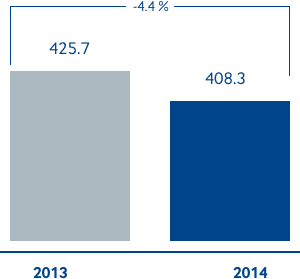 In 2014, BPVi Group company personnel received 34,552 training days, 13.4% more than in 2013. 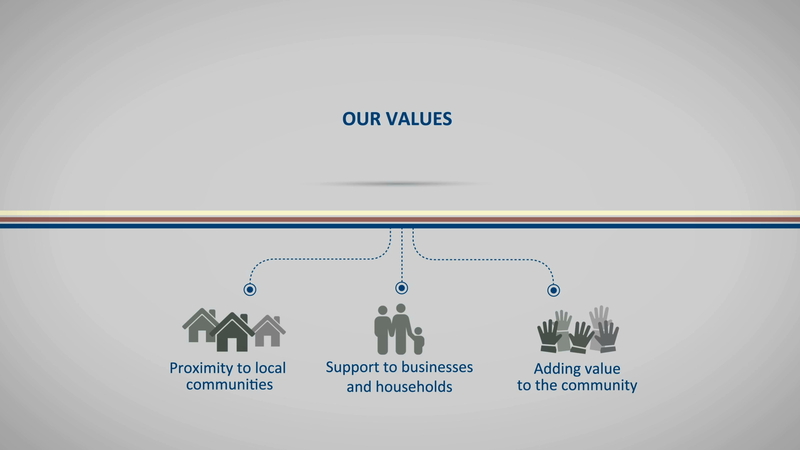 Participation in corporate culture and values is an essential tool to promote a sense of belonging: since 2013, we have made significant investments in internal communication initiatives, with the objective to facilitate the dissemination of information systematically across the company and to encourage active participation and cooperation. “the working classes, small enterprises, small businesses and shopkeepers could easily access the credit made available by the fruitful and liberal system of social security and mutual insurance”. 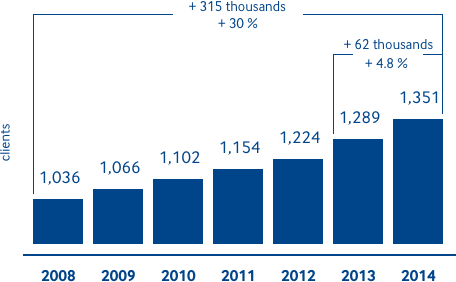 Our “approach to banking” has helped us to improve the appreciation and satisfaction of our Customers and to increase their number to nearly 1.4 million at the end of 2014 (+4.8% in the last year); recent customer satisfaction surveys showed that our Group has achieved the highest Customer acquisition and retention levels among Italian credit institutions. 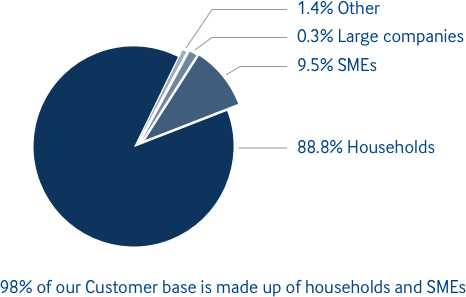 We have a strong focus on households and small to medium enterprises, which account for more than 98% of our Customers and 97% of loans. In 2014, although the macroeconomic environment remained challenging, the BPVi Group confirmed its commitment to supporting local small and medium enterprises, both through ordinary lending activities and through the launch of innovative initiatives, aimed at strengthening the financial structure of the borrowers. 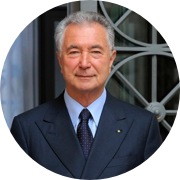 Banca Popolare di Vicenza has entered into a number of agreements with major trade association, credit guarantee consortia (Confidi) and public agencies operating in the areas where BPVI Group is present. With approximately 600 agreements and conventions in place at the end of December, the Group's lending capabilities contribute to the country's economic recovery and are at the service of Public Institutions. The BPVi Group is one of the very few Italian banking groups that recorded an increase in loans: +2.6% from the end of 2010 to the end of 2014, with a total of 11.7 billion Euro of new loans disbursed to households and businesses in the last 4 years. This trend has been sustained, in particular, by intense activity in new loan origination. 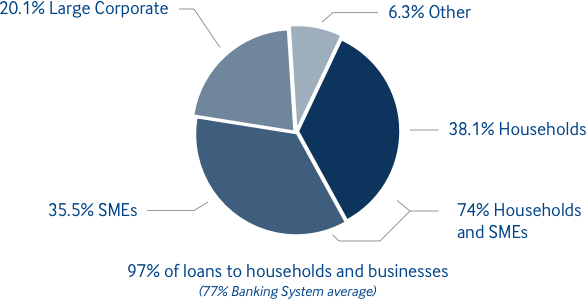 of new origination: Despite continuing weakness in demand, in 2014 the Group granted approximately Euro 2.4 billion of new loans, of which 37% were to households and 44% to small and medium enterprises in the areas where the Group operates. Our constant commitment to supporting economic recovery in the areas where we operate is confirmed not only by our intense lending activity, but also by important and innovative initiatives aimed at providing a practical response to the structural financial needs of enterprises, for example through minibonds or assistance to SMEs in their listing process. 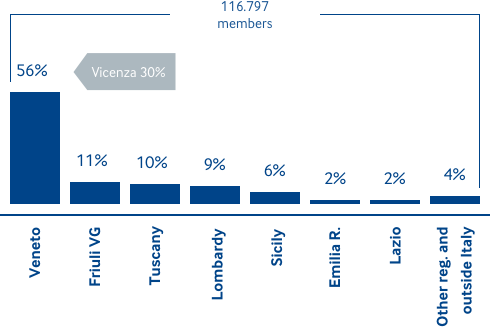 In particular, in the minibond offer Banca Popolare di Vicenza is establishing itself as one of the most dynamic institutions in the market, and in 2014 had already achieved a market share of 43% in terms of volumes in the Euro 5-50 million segment. 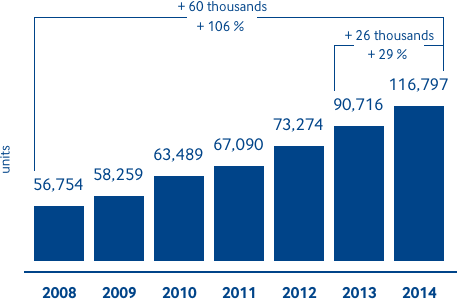 Our Stockholder base consists of 116,797 Members/Stockholders at the end of 2014 - more than twice compared to the end of 2008. In 2014, the Euro Area economic trend is positive in Germany and recovering in Spain and, to a lesser extent, in France. In Italy the recovery is still unstable, giving way to a new recessionary phase, brought about once again by the weak industrial production and by the persistent fragility of domestic demand, with only moderate support from exports. The continuing expansionary monetary policy by the ECB led to a general reduction of reference rates, which resulted in a decrease in the cost of funding as well as a drop in the rates applied to loans to households and enterprises, in the case of the latter also due to greater competitive pressure among credit institutions. During 2014, however, the persisting challenges and uncertainties in the national economic scenario were detrimental to Italian banks, whose lending activities decreased. This negative trend is due on the one hand to weak demand for new loans, particularly by enterprises, and on the other to a more careful selection of banks' offers as a result of the high risks of borrowers and of the high capitalisation levels that the ECB required to the Italian credit system. The persisting weakness of the economic cycle also affected the quality of bank credit in Italy, resulting in strong deterioration. In December 2014, the stock of gross non-performing loans rose to 183.7 billion Euro, with a 27.8 billion Euro increase in the last 12 months. However, the annual growth rate of non-performing loans continues to slow down: while still high, the 17.8% increase recorded in December was the lowest in the last 2 years. Conversely, the ratio of non-performing loans to total lending continues to worsen (9.57% in December 2014 from 8.07% in December 2013, or +1.5 percentage points) as a consequence of the increase in non-performing loans and the decline in lending. Significant increases were also recorded in the other categories of impaired loans (watchlist, past due and restructured exposures), whose incidence over total lending rose to 7.72% in September 2014, last available figure, from 6.64% in September 2013. 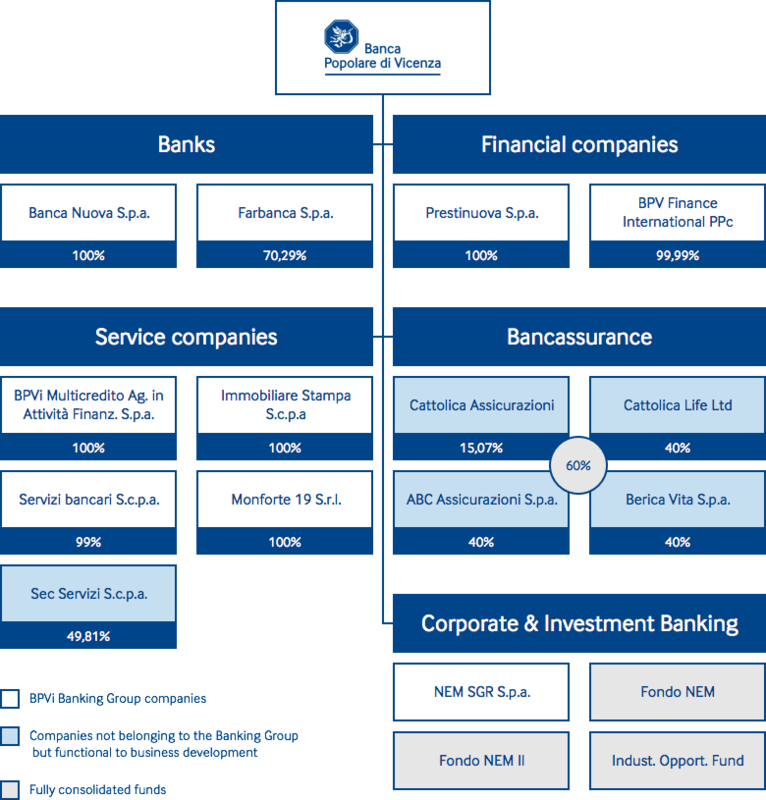 The BPVi Group is one of the 15 Italian banking groups that, in 2014, underwent the Comprehensive Assessment (Learn more) promoted by EU supervisory authorities in cooperation with national authorities, in view of the switch to the Single Supervisory Mechanism under the ECB that took place on 4 November 2014. The BPVi Group passed the ECB assessment and was recognised with full rights as one of the 120 leading banks in Europe, having shown excess capital both in the Asset Quality Review (593 million Euro), and in the Stress Test (554 million Euro under the base scenario and 30 million Euro under the adverse scenario). The Single Supervisory Mechanism (SSM) is the first pillar of the European Banking Union, through which the ECB, in close cooperation with the National Supervisory Authorities, took over supervision on all Eurozone banks, directly in the case of “significant” intermediaries (those covered by the Comprehensive Assessment) and indirectly in the case of “less significant” intermediaries that will still be monitored by local authorities on the basis of criteria established by the ECB. The Comprehensive Assessment had as its main objectives to improve the quality of the information available on the situation of the banks and to identify and implement any corrective actions designed to assure investors about the reliability of banking system. Core business results are constantly improving, with a stronger capital base, an increasing number of Customers and Shareholders, and higher income from traditional operations with Customers. The positive results achieved allowed the Group to adopt a particularly cautious approach to loan loss provisions and goodwill write-down, improving the quality of assets and laying the foundations for increasing the institution's future profitability. 10 transactions with total placements amounting to Euro 190.4 million with the involvement, as subscribers, of more than 40 financial institutions. In the minibond offer, BPVi is establishing itself as one of the most dynamic institutions in the market, and in 2014 had already achieved a market share of 43% in terms of volumes in the Euro 5-50 million segment. 2014 was another challenging year, not only because of continuing difficulties and uncertainty in the macroeconomic and financial environment, but also and more importantly due to radical changes of a regulatory nature that affected the European banking system, with inception in November 2014 of the Single Supervisory Mechanism, the first decisive step towards the European Banking Union. This phase was preceded by an intense period of in-depth prior assessment by the ECB (known as Comprehensive Assessment), which lasted approximately 1 year and involved, requiring considerable effort, the 130 top European credit institutions (15 of which Italian), including Banca Popolare di Vicenza. The BPVi Group passed this thorough review with excess capital not only in the Asset Quality Review, but also in the strict Stress Tests; however, as a result of the assessment the Board of Directors of the Parent Company decided to adopt a particularly prudent approach in the provisioning and asset valuation policies. The successful result in the ECB's Comprehensive Assessment was made possible by the good capitalisation level reached by the BPVi Group, strengthened by the capital increase initiatives implemented in 2014 (608 million Euro from the extraordinary capital increase and 102 million Euro from the new Members campaign). This allowed the achievement of pro-forma Common Equity Tier 1 (including conversion of the 253 million Euro of convertible bond) equal to 11.34%. The positive performance of the Group's core business allowed the adoption of a particularly prudential approach in goodwill valuation, with total write-downs of approximately Euro 600 million (65%), also in view of the uncertain evolution of the Banking System's regulatory and operational framework. 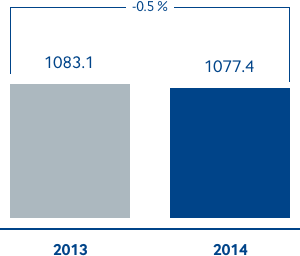 As a result of these goodwill value adjustments, the net consolidated loss amounted to Euro 758.5 million. The 1.5% decline is mainly due to the lower contribution from the securities portfolio. 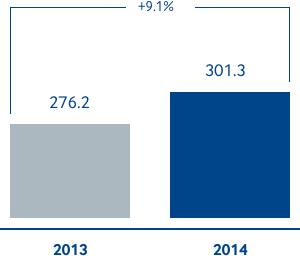 Strong growth of the net interest income, net of contribution from the securities portfolio (+8.2%). Net fee and commission income increased by 9.1%, due among others to income from indirect funding and minibond transactions and to the elimination of the cost connected to the State's guarantee on the Group's own bonds. 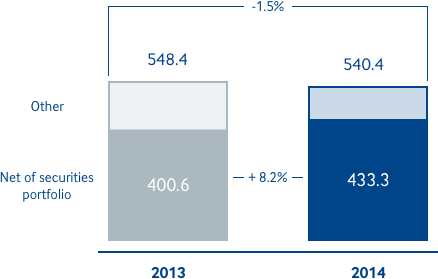 Operating income remained essentially unchanged from 2013 (-0.5%), thanks to the increase in revenues from traditional operations with Customers, which offsets the smaller contribution of revenues from finance activities. 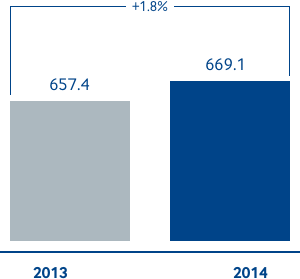 The marginal increase (+1.8%), mainly related to the acquisition of 16 Carife branches. 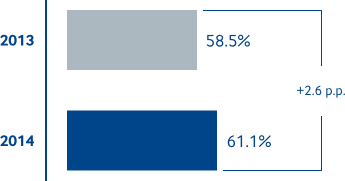 61.1% (+2.6 p.p. compared to the end of 2013).